Another animated family-fun production from Pixar and Walt Disney studios. Metroville was once the home of many superheroes – incluiding Mr Incredible and Elastigirl who, under their own secret identities, have now married and started a family. In the superheroes' heyday, Mr Incredible had a most annoyingly persistant fan in one Buddy Pine...who even went so far as to emulate his hero by wearing a small costume similar to that worn by Mr Incredible, and tried to ingratiate himself as “Incrediboy!” I don't know who finds him more of a pain: Mr Incredible himself or we, the viewing audience! 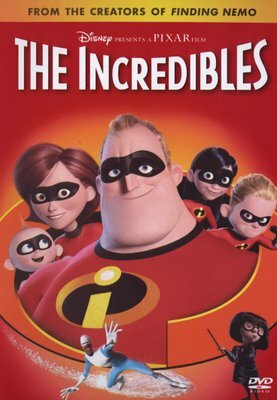 Mr Incredible is recalled to duty by the mysterious “Mirage” for one last great action showdown...and this time around, the whole family gets involved – including the children, who are starting to display superpowers of their own! The animation is superb...but unless you're already accustomed to the “Hercules” style of artwork, the characters' facial close-ups could take a bit of getting used to.